In my forty over years of teaching cooking classes. I often repeat to my pupils. That Chinese cooking is an art, a culture ? this is what makes the Chinese proud. It also is the force behind a happy family. A table that is lay with hot food. Brings the warmth to everyone's heart in the family. I often said: A mother that cooks, will not bring up misbehave child. They will bring home their friends to enjoy their mother's good food. Isn't that increased the tie between the family members? I would like to talk about a series of Chinese food. 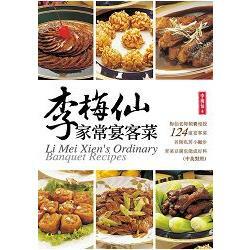 And I know "Li Mei Xien's Home Banguet Recipes" will be a practical reference book for housewives. In this book, the steps are easy, and the taste is super. Cooking at home, should always emphasis on simplicity. But should be creative on the color of the ingredients and the taste. There are three important ingredients in master Chinese cooking: cutting method, control of the heat, seasoning. If one can choose the ingredients carefully, and always tasting and improving, master the art of keeping the food fresh and crispy. Being adventurous to mix new taste in seasoning, everybody is able to dish out a table of "Pleasant to the eyes and a treat to the stomach" dishes. Although Chinese cooking is much more complex than western cooking. But the end result is worth doing it. Take an example of roast beef in western cooking. The roast is simply place on hot plate. The flavor has to rely on the trimming and seasoning on the side. This is why Chinese cooking has a lot of plus point to boost about. I have been working as a volunteer at Young Women's Association for years. Regardless of the weather, I often travel with all the mothers to every community, to spread my wish "Master your cooking skill". Although I have been praised of "Good cook" I am still learning, as Chinese cooking is so wide and wonderful. I am very pleased that nowadays, a lot of parents are spending more time in the kitchen. I sincerely hope this book will serve as a starting point, to bring out the interest of many more people, to "Prepare good food", to carry on the art of Chinese cooking.